Jim Templeton died on 27 November, 2011. His name will mean little to all but the most ardent students of British ufological history. But the photograph he took in 1964 will be familiar to most Forteans and has been reproduced numerous times on TV and in books and magazines during the past 48 years. Although the photo depicts a strange space-suited entity rather than a UFO it nevertheless remains one of the most puzzling Fortean images ever taken. Though the photo itself is often claimed to be a hoax the circumstances that surround it are frequently used to justify the existence of shadowy, MIB-like, government agents. 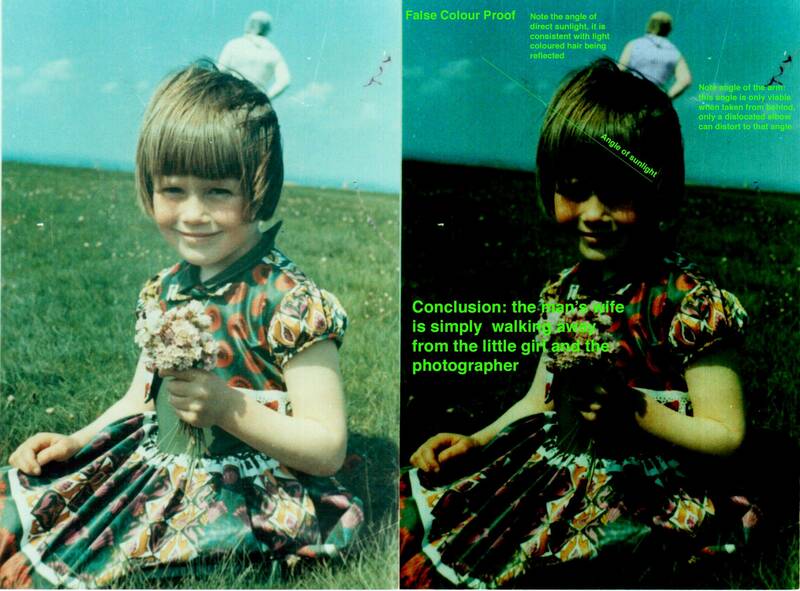 Carlisle fireman Jim Templeton had a passion for photography, and on 24 May 1964 took a photograph of his eldest daughter on the Solway Marshes, the strip of land on the south side of the Solway Estuary, separating England from Scotland. When he collected the processed film the shop assistant said, “That’s a marvellous colour film, but who’s the big fellow”. Jim was baffled until he took a close look at the photographs. On one print, apparently standing just behind his daughter’s head was a large figure dressed in a ‘spaceman’ suit. Jim knew there had been no-one else around at the time he took the photograph and immediately had the negative tested by contacts in the police force and with the film’s manufacturers, Kodak. Both said the image had not been tampered with and could not account for what the Cumberland News began to call the ‘Solway Spaceman’. The photograph was soon on the front page of the local newspaper and within days Jim and his daughter became media celebrities as the image was flashed round the world. But the price of this involuntary fame and attention was high. Jim’s daughter was taunted and bullied and he had to take his daughter out of school for a while because her nerves were suffering. The Ministry of Defence showed no interest in the case until the Cumberland News contacted them for their opinion. The MoD said they would be pleased to analyse the photograph, but when Jim discovered they required the original film and camera for analysis he refused and no official file exists to show they pursued the matter any further. Whether or not Jim was just being cautious in refusing to supply the original film and camera for analysis or whether he had good reason for not letting them out of his hands is a matter for speculation, especially in view of information that has arisen in recent years. A strange event then took place which has convinced many UFOlogists that the MOD were interested enough to covertly send a pair of secret agents to investigate the bizarre photograph. Later that summer Jim was visited at the Fire Station by two men. They were dressed entirely in black and drove a brand new black Jaguar car, unusual garb and transport for the times. They asked to be taken to the place where the photograph was taken. Jim queried their identity and was shown a card bearing an official crest and the word ‘Security’. They told him, ‘We’re from the Ministry, but you don’t need to know who we are. We go by numbers.’ Jim noticed the pair referred to each other as ‘nine’ and ‘eleven’. Their obvious lack of knowledge of the area and inability to pronounce local place names led Jim to conclude they weren’t local people. Once they reached the marshes Jim said the following conversation took place: “Pull up on here. This is where the photograph was taken.’ They asked, ‘Can you take us to the exact spot?’ I said, ‘Yes.’ So we walked across, and I said, ‘This is where the photograph was taken.’ One looked at the other, and the other looked at him and said, ‘This is where you saw the large man, the alien?’ I said, ‘No, we didn’t see anybody…I never saw anybody.’ ‘Thank you very much,’ he said, and he walked away.” In a somewhat bizarre conclusion to the encounter, the two men drove off, abandoning Jim to walk a mile to the nearest garage for a lift to Carlisle. Jim Templeton never saw the mysterious Men In Black again. This case has become a cause celebre in ufology, and has featured in a number of books and articles within the context of a Government cover-up. Analysis of the paper trail surrounding the case demonstrates how fact has become entangled with fantasy, with the result that another layer of confusion has been added to the MIB mythology. When the authors questioned Jim Templeton in 2001 he told us he firmly believed the mystery visitors were sent by the British Government. He has also made this statement to UFO to other writers and researchers in recent years. Jim’s mysterious visitors have been tied in with all kinds of spurious events in an attempt to keep the idea of government MIB-type agents alive. For example, Jim’s photograph has been linked to an anomalous ‘figure’ that was supposed to have appeared on a Blue Streak missile firing range at Woomera in south Australia. The link with Solway Firth appeared to be that Blue Streak missiles were developed and tested at RAF Spadeadam in Cumbria. They were part of a British missile system designed to be used as the first stage of a satellite launcher. Templeton repeated this story when interviewed by Jenny Randles for a BBC2 documentary on Tales of the Paranormal (1996). He said the Australian technicians had claimed the figures were ‘exactly the same type of man: same dress, same figure, same size as in the original photograph.’ The mystery appeared to increase when, as part of the research for the programme, Jenny searched UFO files from 1964 held by The National Archives. There she found letters from members of the public referring to both the ‘Cumberland spaceman’ and to a ‘mysterious object’ captured on film during the rocket launch. But there was no trace of the can of film referred to in the archives. Had it been removed by the Men in Black? The mystery also gripped MP James Fraser who, following the 1996 TV show, asked MoD what had become of the ‘missing’ film. Files released by The National Archives in 2010 revealed that inquiries by the UFO desk discovered the film in question was neither secret nor ‘missing’ (DEFE 24/1983/1). It was in fact part of a British Pathe newsreel and the original is held by the Imperial War Museum. Stills from the film were widely published by newspapers and the British magazine Flying Saucer Review shortly after its release. It shows a rocket test on 5 June 1964 and the ‘mysterious object’ visible in the sky beside the launch pad is clearly the result of a classic lens reflection. The film ‘Blue Streak – Two, One, Zero! 1964’ can be viewed at the British Pathe website here. Research published at www.cumberlandspaceman co.uk reveals there were two aborted rocket launches at Woomera the preceded the test shown in the British Pathe footage. The first, on 25 May, was halted due to ‘bad weather’, the second on 2 June was aborted due to a systems fault. One of these events must logically be the source of the ‘spaceman’ rumour overheard and spread by Jim Templeton. But there is no contemporaneous record, either from a newspaper or official source, that refers to the appearance of a ‘spaceman’. There were, however, lots of stories about a ‘UFO’ – actually a lens flare – spotted on the film of the 5 June rocket test. No real evidence of any connection between these events, or indeed proof that a similar ‘figure’ was ever seen at Woomera, exists. UFOlogists have never let UFO fact get in the way of UFO fiction and an air of mystery still pervades these claims. The story of the Solway Spaceman has become a UFOlogical legend. But there is another much more interesting view of the story and one which, while it may not solve the case entirely, could, once and for all, cast reasonable doubt on Jim’s claims that the photograph and the MIB story is genuine. Contemporary newspaper records from 1964 reveal that Jim Templeton took a very different view of the matter shortly after he had taken the infamous photograph. In September that year his story of the MIB visit reached the national media and journalists asked the Carlisle police for confirmation that Jim has been quizzed by the security services. Jim Templeton was a very sincere man but it seems that his interpretation of what took place on the lonely Solway Marshes in 1964 has, like so many elements of the UFO mystery, been coloured by what the media and UFO writers have wished to be the truth. In 1964 British UFOlogy was in the doldrums. The great days of the 1950s saucer scares and contactees, when flying saucers made news headlines on a daily basis, were long gone and both flying saucer enthusiasts and media alike were looking for any story that would keep flying saucers in the public eye. The Solway Spaceman photograph did just that and paved the way for British ufology’s great re-invention in 1966 when the so called Warminster Phenomenon began. Perhaps, in trying to perfect his photographic techniques, Templeton did create the ‘spaceman’ photo or perhaps, knowing of his liking for practical jokes and eager to play one on him, it is not inconceivable that someone in the processing labs tampered with the film to create the ‘alien’ image. Within days the image was world famous. That, coupled with the fact that Jim’s daughter was upset because of all the attention she attracted, would make it impossible for Jim to confess to a hoax or for someone to say ‘sorry, Jim, it was just a joke’. This is exactly what took place in other celebrated UFO photographic cases, where the instant fame achieved by the pranksters later prevented them from making a full confession and the stories became cemented as ‘fact’. Subsequent retractions years later were either dismissed by media and UFOlogy or fudged by the witnesses themselves to minimise embarrassment. So who were the Jim Templeton’s mystery ‘MIB’ visitors? Former incumbent of the British government’s UFO desk, Nick Pope believes that there may be ‘Walter Mitty’ types among the civilian population who are prepared to impersonate MOD officials in order to speak to UFO witnesses for their own reasons. Evidence for such individuals is well documented in the MOD files. And there, the story ends, for now. Jim is gone, but his story and photograph live on. The Solway Spaceman is an iconic image from a simpler time. A time when people believed you if you said you were from ‘the ministry’ and when the photograph of a ‘spaceman’ held untold potential for the human race. For some, it still does. Hey, Dave and Andy. Interesting article. Minor quibble – the Warminster UFO phenomenon started in 1964 too, technically, and went bonkers from ’85 onwards. And was it really a “so-called” phenomenon? It *was* pretty phenomenal. (And, anyway, I prefer Shuttlewood’s term – “mystery”). I could be flippant and say “mystery solved – it’s the Stig”… however after studying the full sized image here, it looks to me like someone standing with their /back/ to the camera. The dark pattern on the “head” in that case only suggests a dark “visor” at first glance. Now I’ve looked again, it does appear to be a woman wearing a head scarf ( fairly typical of the time ) and hand on the hip. Actually the arm itself is all wrong when you look at the image as a space alien. The elbow is bent forward against the crease of the shoulder. So unless the space alien was part flamingo, I’m now finding it difficult to see it any other way. Dave/Andy, great article. I’ve always liked this story, even though I can now see what it is! You would have to be standing in an odd way for it to be the back of you…doubt if anyone will ever know. How many times have we heard this “not present at the time but showed in image later” claim? It looks as if Jim was a bit of a flying-saucer nutter and was influenced by Klatuu’s fencing-gear spacesuit. The mask, white padded vest, hand at hip, all seen from behind; but for Jim’s word, it’s all too obvious. The negative strip contained better pictures of Jim’s friend in his gear I’d bet. And when his instant celebrity had waned, Jim invented a MIB story for another fleeting rush of fame. Forgetting Jim’s story (there’s nothing overtly ufoish about the figure), on a purely mechanical level, the picture’s interest lies in its ambiguity by juxtaposition of innocent child and menacing figure on a stark landscape, a bit of Sixties surrealism, whether by design or happenstance. Typical ufoolery. “The first live firing was eventually fixed for the 25 May 1964 but was stopped automatically 2 and a half hours before launch, due to ‘bad weather’ “. “On 2 June 1964 engines stopped automatically 3 seconds due to a ‘fault of obscure nature in safety systems of both rocket and ground installations’ “. I have researched the Spaceman incident for the last 20 years, you may find my own research intresting re : the Bluestreak incident. Thanks Dave – I’ve updated this article with your new information. The summary on your website is excellent. But basically, the conclusion is the same – the story about the spacemen on the launch site is pure hearsay. There is no contemporaneous evidence for such an event and still less of any cover-up. The Dalton-Morgan story is even less convincing. I spoke to Gp Captain Dalton-Morgan shortly before his death and I’m convinced he had simply picked up the story from the UFOlogists he knew in Australia who, in turn, had heard it on the grapevine – this is a perfect example of how urban legends are spread! Looking at the photo a few years ago, I independently came to the conclusion that the “spaceman” is a quite ordinary human being standing with their back to the camera. If this is indeed a person (rather than, say, a scarecrow or a simulacrum), the position of the arm cannot be explained in any other way. Although this argues against the photo being staged, it doesn’t mean that there is anything parnormal about it. I have often wondered why Templeton took THREE identical photos of his daughter. Why not three in different poses. This has never been questioned before, as far as I know. Was he ever asked why? As for why they’re all the same pose, maybe he just liked it. The first time I saw this photo, it looked like a person with their back to the camera, right arm bent. How silly all this nonsense is! That’s the case it tries to make anyway, though not very convincingly. To be true: Jim T would have had to have been an eejit who couldn’t recognize his own wife in his own picture (and that Jim’s wife couldn’t either); that Jim couldn’t see that there was a person standing in the field of view–even through the viewfinder–as he framed and snapped the shot; that Jim had no memory of the event and was as truly mystified by the “big fellow” in a “space suit” as the shop assistant who supposedly quizzed Jim about the image; Jim’s wife has broad shoulders and large arms; Jim’s wife was wearing a hat and scarf–which would not be unusual except that, supposedly, neither Jim nor his wife recognized them in the picture; and so on, and it was merely an accident, a sort of “found” mystery, and Jim was an innocent fellow–despite the fact that he played this “spaceman” mystery to the hilt, even adding a sort of “men in black” episode later to renew interest in it. Maybe. But there’s a much better answer that fits all the facts in context: Jim was a nutter and hoaxster, and he knew perfectly well the identity of the person. And maybe it is Jim’s wife, or maybe it’s a “big fellow” helping amateur photographer Jim create the sort of arty surrealistic shot that he could have seen most likely in big glossy photography magazines in 1964. Either way, it’s a hoax because Jim pretended not to know the who, how or why of the photograph he had made–which is not believable. Sorry, there are just too many hallmarks of the typical “UFO” photo here to let Jim off so easily, even though the article does try to cover this point of view in the final paragraph. I would agree Caralax. Unless there is some defocusing background affect at play here with the camera. The Spaceman is too broad in the shoulder area to be Jims wife. This wife photobombing explanantion is about as plausible a one as there is but it is too convenient. All of the photos of the time show wife Annie to have a slight build – especially around the shoulders. Sorry that should say “I agree with Dwayne”. Tina; I think we accept that most plausible identity. We both say it. But wife or “big fellow,” staged or happenstance, “it’s a hoax because Jim pretended not to know the who, how or why of the photograph he had made–which is not believable.” And then there’s his MIB story. You say “as indicated by Templeton.” Do you have knowledge of Templeton admitting his hoax? The girl is sitting down, which would cause a small shadow. As you can see in the picture, it does. The mysterious spaceman, who is obviously quite higher, taller than the little girl, should be casting quite the shadow, but there is no shadow…….interesting. Why is the so called spaceman so slanted? The girl is sitting down on the same hill straight as can be. The spaceman shouldn’t be that slanted. When you walk on a hill, you readjust yourself as much as you can to become as vertical and straight as you can in order to prevent you from toppling over. Or it could be a ghost captured on film………………. The shadow of the girl is actually quite small (see also the flowers in her hand and the shadows they cast) and the angle indicates the sun to be quite high. I would, therefore, not expect to see the shadow of the wife… I mean, the spaceman,… because the daughter is obscuring it. One thing that struck me when I read about this years ago (probably in the late 90s) was that Jim Templeton was adamant that no one else was in the frame when he took the photo. That made me believe it was something out of the ordinary. However, since getting into photography in 2002 and using DSLRs since about 2007, the same thing has happened to me – I’ve been so intent on making sure that what’s in the foreground is in focus/lit properly that I’ve barely paid any attention to the background. I can totally see Templeton focusing on his daughter and telling her to smile, or hold the flowers up or something similar, and not noticing the appearance of the figure in the background. To me, it is quite obvious that the ‘spaceman’ is his wife. Has anyone else noticed the slight bulge which could be the bra strap catch? Case closed as far as I am concerned. By the way Jon – ghosts don’t exist. I was watching a YouTube video on Jim Templeton’s photo today, when something in the image caught my eye. Some anomalies that I, strangely, hadn’t noticed previously. 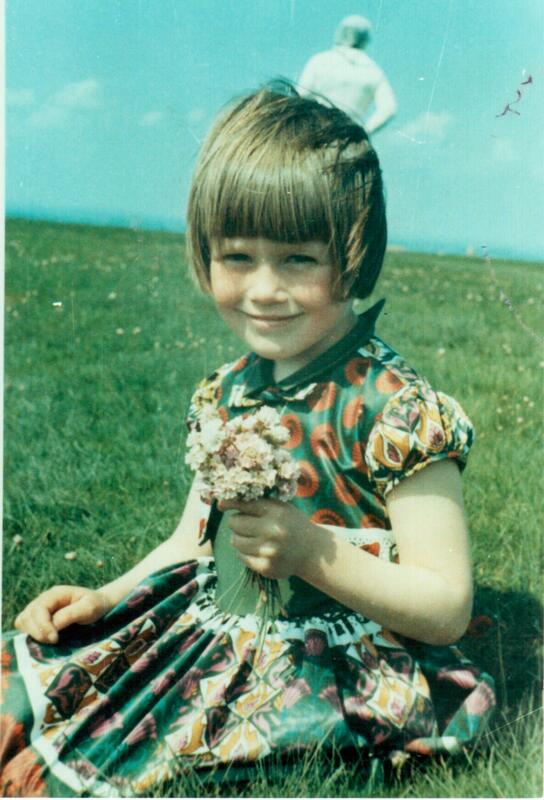 I made a point to examine several additional online images of the “Solway Firth Spaceman” photo (including the one, here, on your website) with a a magnifying glass. Immediately, I noticed that all of the images contain three faint, slender, pale, (relatively) vertical “lines” which appear to frame or line-up the unidentified figure (To the left of the L. “arm”; To the right of the “head”; To the right of the Rt. “elbow”). Also noted: Two small, pale dots/spheres are visible – one above and one below the bend of the “elbow”. These anomalies point to this photo being some sort of a composite image. The Sun appears to be above and to the left of the child, as you can see her shadow on the grass. And yet, curiously, the so-called “spaceman” (allegedly standing on the hill behind her) casts no shadow, whatsoever. Surely, if there had been any three-dimensional, physical, humanoid being standing behind the child, it would have cast its own shadow, as well.. If these “lines”, “spheres” and painful-looking stance are in the original photo and negative, then, these things all point to the photo being be a hoax. Please let me know if you, too, can see these anomalies and your opinion – if any – of them. However, following this I discovered there are other photos from the same roll of film that show another person with Mr Templeton and his daughter at the same time the photo was taken – Mrs Templeton! This contradicts the later claim that they were there alone. My analysis of the photo seems pretty cut and dry just based on the optical information, but when you then add in the likelihood that it is Mrs Tempelton and that Mr Templeton had a history of spinning tales based on real incidents, then it is easy to see how this story got to where it did. The photo is not a fake, it’s just a misinterpretation. Excellent piece of research Gordon. Nine, now eight. are the rest of you out there? anyone saying ‘its his wife, case closed’ like their lives wrapped up neatly with a bow on top, with no time for anything which might challenge their views. how could a man take a photo of his daughter and not realise that his wife had walked into the background, whether he could see her through the lens or not? either just before looking through the camera or just afterwards he still could have, and why would she walk into the shot in the first place? it’s ridiculous. and IF it was her in the background, wouldn’t it actually look slightly like her?! for the people who said jim was too busy concentrating on the foreground and his daughter to notice, laughable. it’s okay for people to say they don’t know or understand, stop this constant need to explain things. some things are just genuine mysteries and will only be solved with time, if at all. Because she didn’t realise she was walking into shot, and because, as discussed by people who know the camera, the viewfinder doesn’t frame the whole picture, so it’s perfectly plausible somebody could have walked into shot. Not only that, but even when using cameras with good viewfinders, things appear in frames and ruin photos that people would prefer not to appear… Because people focus on the subject, not the entire frame. And it does look slightly like her, or a woman at least, with the same colour dress as in other frames. While I’m willing to countenance something that doesn’t wrap everything up neatly with a bow on top, I do like to think that if there’s a probability of a woman walking into frame wearing a similarly coloured dress to somebody already there, then that is the most likely solution, not a spaceman. It’s also not an isolated photo. The frames prior to this are of his wife sitting on the ground. So she was there. Lol! Do you realize the irony of what you just said there?? How much time has passed? Almost 45 years! The solution you dismiss IS the best available, whether you like it or not. How much more time do you want to pass before someone provides a solution you agree with? If you happen to get to see an original copy of the photograph then you can clearly see Mrs Templeton’s bra strap. I agree with you concerning the fact that the photographer must have surely known that his wife was in the picture. He also stated that she was not with him on the day when other pictures on the roll of film clearly proves otherwise. Delving deeper into ‘mysteries’ usually proves they clearly just are not.